Updated: Feb. 10, 2012, 6 p.m. The agreement came after days of drama and delay. In the end, Greek political leaders finally acceded to tough new austerity measures in exchange for more bailout loans. But no one was celebrating. Several ministers resigned. The leader of one of the three parties in the coalition government withdrew his support and blamed Germany for Greece's problems. 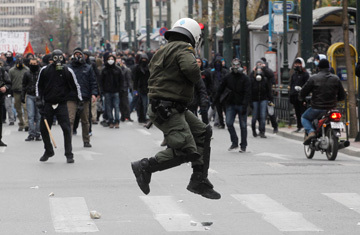 Workers went on strike and resumed antiausterity demonstrations, which devolved into clashes with riot police. And euro-zone leaders said they wouldn't hand over the new loans, which total about $171 billion, until the Greek Parliament approves the deal. The new austerity cuts include a controversial 22% cut in the minimum wage, which currently stands at close to $1,000 per month before taxes, as well as a promise to cut 150,000 jobs from the government payroll of 800,000 by the end of 2015. Prime Minister Lucas Papademos dealt with the defecting politicians by telling his cabinet that those who couldn't handle the "historic responsibility" of rescuing Greece from this crisis should leave the government. "We cannot let Greece go bankrupt," he told cabinet ministers on Friday. "A disorderly default would plunge our country into disaster. It would create conditions of uncontrolled economic chaos and social explosion." Papademos explained in detail what this default would look like: imports, including fuel, would become prohibitively expensive. The state would run out of money and wouldn't be able to pay wages or pensions. There wouldn't even be enough money to run hospitals and schools. "A disorderly default would plunge our country into disaster. It would create conditions of uncontrolled economic chaos and social explosion," he said. "All these developments would lead, sooner or later, to Greece's exit from the euro zone." His cabinet, now comprising members of Greece's two largest parties, voted unanimously late Friday to support the new deal. Now it goes to parliament, where lawmakers will vote on it either Sunday or Monday. It's a painful choice between more austerity, which has devastated the already weak Greek economy, and a reversion to the drachma, the country's currency before the euro  something economists say would be far worse. "In the beginning, it would be especially catastrophic," says Panos Tsakloglou, a professor at the Athens University of Economics and Business. "People with money in Greek banks would see their savings evaporate. They would clean out supermarkets, because most goods are imported  and the price of these goods would go up dramatically." The drachma isn't just a metaphor for instant poverty. For many, it also symbolizes a disheartening slide into the past. Some nostalgic Greeks call the old currency the drachmoula, or little drachma, as if it's a long-lost friend, but polls show that most Greeks would rather stick with the euro. "We would be isolated in Europe if we left the euro," says Dimitris Zimonopoulos, 43, who runs a trendy souvlaki diner in central Athens. "And I worry what would happen to us in that isolation." Vicky Christopoulou, 35, the manager of a vegetarian restaurant near Parliament, says she worries that "drachma politicians" would continue running the Greek economy like a patronage system for supporters. That would strangle innovation and progress, she says. "The Europeans haven't been very kind to us, of course, but I worry that if the country is left to its own devices, our own politicians would treat us even worse," she says. "I look at both choices, and both seem very frightening." The pain of austerity is already obvious. The country is in its fourth year of a deep recession. The overall unemployment rate is at more than 20%, with some 48% of young Greeks out of work. The Finance Ministry says 111,000 businesses closed down in 2011. Half of Greece's homeowners say they can't pay their mortgages this year, according to a recent poll. "Everyone knows someone who is out of work or on the verge of losing their home," says Yiannis Tsintzos, 32, a news producer whose company hasn't paid him in months. Not only have Greeks suffered mightily; they also see that their sacrifices in the name of austerity  which have included wage and pension cuts as well as much higher taxation  seem to be going nowhere. Greece's debt is now at nearly 160% of gross domestic product, and the country continues to miss deficit targets set by international lenders. So it's no surprise that a recent poll by the firm Public Issue showed that 91% of Greeks believe the country is headed in the wrong direction. But the troika of international lenders  the European Union, the European Central Bank and the International Monetary Fund  are not convinced that Greek politicians will follow through on new reforms, since they have yet to implement previous measures such as privatization of state assets and the liberalization of professions. "In Brussels, confidence in Greece is low," says Wolfango Piccoli, director of the London office of the Eurasia Group. "In Greece, politicians are facing a kind of political suicide if they push through a further round of austerity. And no one wants to take responsibility for the program, especially with elections coming." No party wants to face the same fate as PASOK, the Socialist party that ran Greece until November and is now polling at 8% just two years after winning a landslide election. Polls show a rise in popularity among opposition parties that spent the past two years voting against austerity. The New Democracy party, led by Antonis Samaras, leads the polls, and several leftist parties are also seeing their favorability numbers increase. But there's also been a troubling rise in extreme nationalism: Chrysi Avgi, or Golden Dawn, a fascist party of extreme nationalists best known for attacking immigrants, is supported by 3% of voters. That's enough votes for a seat in Parliament. Until the elections, which could happen as early April, Greece is being run by a coalition government led by Papademos, 63, a former central banker and Harvard professor. Papademos was appointed in November to secure the second bailout and a separate bond-swap deal with private creditors to cut Greek debt by at least 50%. Greece needs both deals to avoid a disorderly default in March, when bond payments come due. Papademos has said repeatedly that he wants to keep Greece solvent and in the euro zone, but he's been hampered by Greece's fractious politics. Unlike Italy's Mario Monti, who insisted on appointing a Cabinet of technocrats to implement austerity measures, Papademos had, until Friday, an unwieldy cabinet of 45 ministers from three feuding parties. The smallest of those parties, the Popular Orthodox Rally, or LAOS, which is led by a former bodybuilder and TV-station owner named Giorgos Karatzaferis, left the coalition on Friday. Along with Samaras, Karatzaferis spent days delaying the second bailout. He agreed to it, but then announced on Friday, Feb. 10, that he wouldn't vote for it in Parliament. Echoing other politicians who don't want to take the blame for austerity, he said Papademos should appoint technocrats "who know what they're doing" to his Cabinet. Some analysts say that may be the best solution, despite polls that show that most Greeks want elections now. In a recent commentary in the Athens daily Kathimerini, editor Alexis Papachelas said the current political leaders are behaving like "drachma-era" politicians who are polarizing both Greeks and non-Greek Europeans. "Don't they realize how naked, amateurish and unreliable they appear in the eyes of those who are supposed to be trusting us with their money?" he wrote. The leadership vacuum scares Maria Michalogiannaki, 32, who works in public relations and whose company hasn't paid her in months. "I see no light and no solutions," she says. "And I don't trust anyone anymore." See "Between Lots of Rocks and Hard Places: Greece's Bad Options."